March 17, 1937 – Mayhem reigns in the Loop as “organized mobs of striking taxicab drivers, led by professional sluggers, attacked cabs at a score of points … Drivers were knocked senseless and passengers were threatened and thrown from their seats.” [Chicago Daily Tribune, March 18, 1937] Police arrest 23 during the violence that lasts for an hour downtown and continues in other areas of the city as night falls. 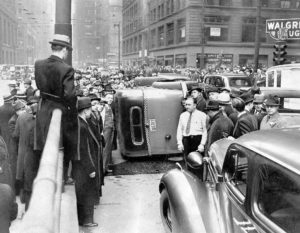 A Checker cab is rolled over at Wells and Randolph Streets, and another one is turned over on Randolph between Wells and LaSalle. Two other cabs are overturned in the vicinity, and a mounted policeman is pulled from his horse and beaten. The reports continue to come in … “One driver who abandoned his cab and ran for refuge to the city hall was caught at the Randolph street entrance and slugged by ten men … Twenty strikers rushed a Checker cab near the Garrick theater and overturned it as the driver fled … At Randolph and LaSalle streets Policeman Pat Neylon dispersed some rioters by leveling a shotgun at them … In front of the Woods theater hundreds gathered as a Yellow cab met the same fate … Rioters struck again in front of the Burnham building, 160 North LaSalle street, overturning a Yellow cab … Joseph Ellers, 28 years old, a Checker driver, was beaten by a gang of eight men who overturned his cab in Washington street near Michigan avenue …” The riot begins after 1,700 strikers attend a meeting early in the afternoon at Atlas Hall, Milwaukee Avenue and Noble Street. At the conclusion of that meeting some 200 men begin walking east in small groups toward the Loop, looking for trouble. The police department floods the Loop with all of the men it can find – 75 student policemen from the East Chicago Avenue station, 19 squads from other districts, and six detective bureau squads. All leaves and days off for police are cancelled until the taxicab strike, now into its twelfth day, is over. The strike goes on for another week before it is finally ended. 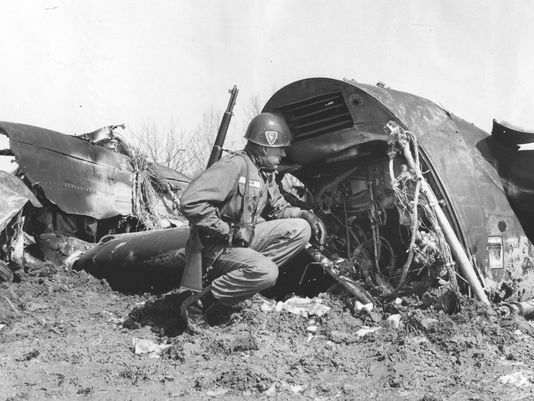 March 17, 1960 -- A Northwest Airlines plane with 63 passengers and crew members explodes above the Ohio River between Indiana and Kenturcky and spreads wreckage over a five-mile wide area. The plane is less than an hour out of Midway Airport enroute to Miami when two explosions blow it apart. Air experts are quick to point out that the accident is almost exactly like an earlier Lockheed Electra explosion less than a half-year earlier over Waco, Texas. An eyewitness, Ted Wilson, a farmer living about three miles from Tell City, Indiana, pins the time of the disaster at around 3:20 p.m. “There was an interval of about 5 seconds after the first explosion when there was a second one,” he says. “I’d not quite reached my porch. When I got there I looked one way but saw nothing. Then right out in front not over 200 yards away in a neighbor’s soybean field there came down the main cabin. It hit the ground and there was a terrible sound—like another explosion, but no fire.” [Chicago Tribune, March 17, 1960] Among the victims sre Judge John A. Sharbaro, a 71-year-old judge, Marty Collins Chalfen, the producer of the Holiday on Ice skating shows and her three children, and Mrs. Andy Frain, the wife of “the nation’s top expert on controlling crowds.” Subsequent investigation determined that the probable cause of the accident was the in-flight separation of the plane’s right wing while cruising at 18,000 feet. March 17, 1921 -- Dr. Frank W. Gunsaulus dies at his home at 2919 Prairie Avenue at the age of 66. J. Ogden Armour, who gave generously to fund the Armour Institute, over which Dr. Gunsaulus presided for its first 27 years, said of the man, "His life was one of achievement; his success lay in helping others to help themselves . . . No one associated, as I have been all my life, with such a lovable character could be other than bowed down with grief at his untimely passing." Gunsaulus came to Chicago in 1887 as a Methodist minister and quickly became a civic leader of the first degree. His sermons and lectures constantly reminded the members of the city's elite of their responsibility toward the poor and uneducated. His philosophy led directly to the establishment of the Armour Institute of Technology, a trade school for the practical arts and sciences, endowed by Phillip Armour and nurtured by his son. 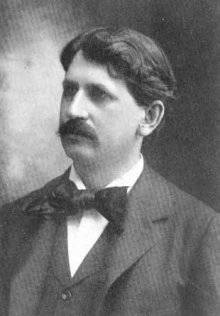 He was the author of 15 books and was a key figure in pushing Chicago as the site of the 1893 World's Fair. His commitment to art and culture prompted railroad equipment tycoon William Miner to donate $50,000 to the Art Institute for new galleries on condition that the addition be named for Dr. Gunsaulus. Gunsaulus Hall, of course, spans the railroad tracks, as it connects the original institute to the eastern campus on Columbus Drive.